Hellooo Summer!! Is 2016 totally flying by, or is it just me? I know it’s not technically summer everywhere (Hi Australia!) and some places have summer all year round, but here on the west coast we’re definitely kicking it into summer mode. Remember summer vacation as a kid? Was that not the best thing ever? Not a care in the world, just two months of pure unbridled summer joy. I grew up in the 80’s, so my summer memories consist of: camping almost every single weekend with my cousin, playing outside until 10pm because the sun was still out (the best), crazy summer thunderstorms (I grew up in Edmonton, where they were plentiful), and, of course, copious amounts of ice cream to help beat the heat. 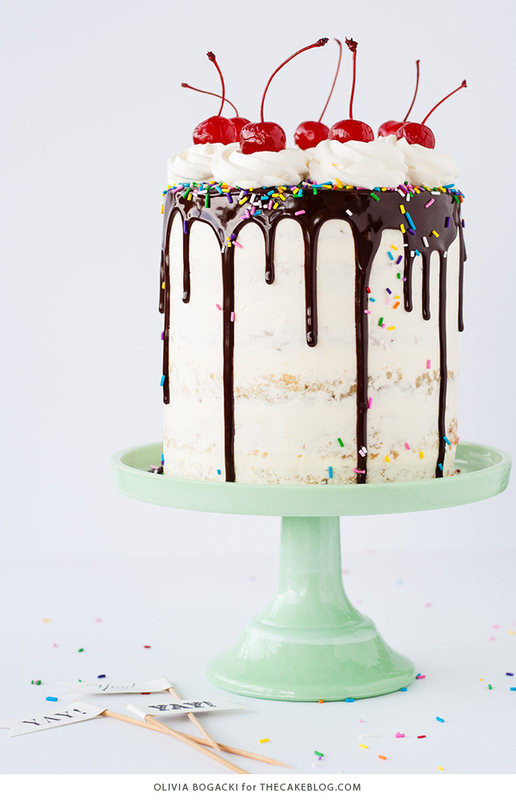 In keeping with last month’s trend of making desserts into cakes, this month I bring you the Banana Split Cake! 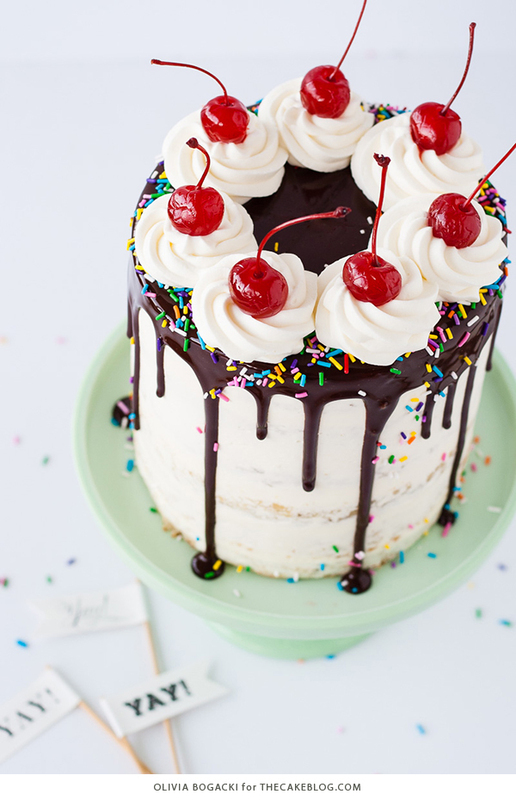 Layers of banana cake and vanilla buttercream, with pineapple and strawberry fillings, all topped off with a silky dark chocolate ganache, sprinkles, whipped cream, and cherries. I think I’ve actually only had a banana split ONCE in my life. Crazy, right? I’m pretty sure it was at Dairy Queen back in those perfect 1980’s summer days. 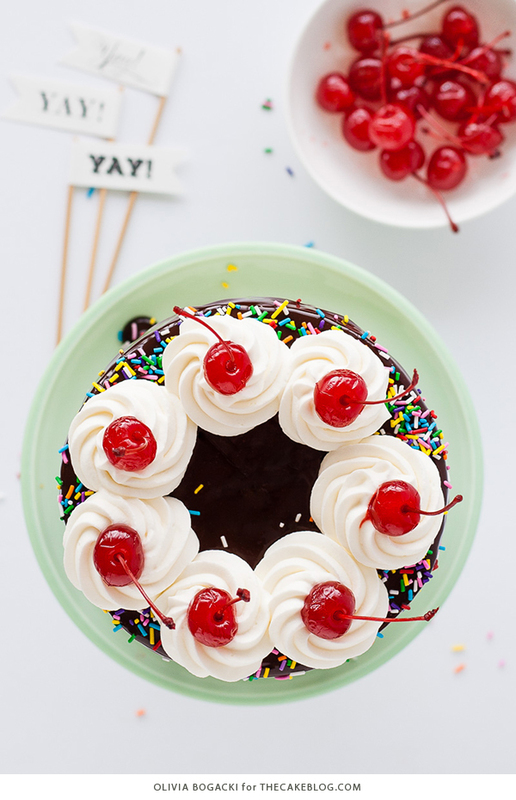 If you’re not familiar with the banana split, you should really seek to amend that as soon as possible, and then try this cake! A banana split usually consists of three scoops of ice cream (chocolate, vanilla, and strawberry) served side by side in a long boat-like dish accompanied by a whole split banana along the sides. It’s often topped with pineapple, strawberry, and chocolate sauces, sprinkles, whipped cream, nuts, and a maraschino cherry. Tell me that doesn’t sound like pure heaven. Well, minus the maraschino cherry for me, you can read all about my distaste for those little red guys here. There are a lot of steps in making this cake, but I promise you they are all easy. If you’re like me, you’ll space it out over a couple days – make the cake layers and sauces on day 1, and finish everything off on day 2. I recommend this for sanity’s sake, but you can certainly do it all in one day if you’re feeling ambitious! Start with the sauces though, as they need time to cool and set. 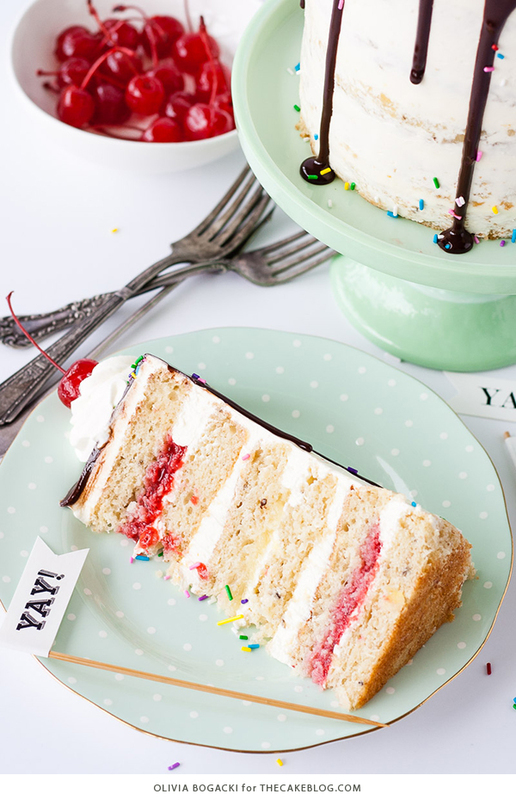 I’m gonna go ahead and say that this Banana Split Cake is even better than the real thing because, hello, it’s a CAKE. And nothing beats a cake. Am I right? Preheat oven to 350F and grease and flour three 6″ cake rounds, line with parchment. Add sugar and beat on medium-high until pale and fluffy, about 2-3 minutes. Reduce speed and add eggs one at a time, fully incorporating after each addition. Add vanilla and mashed bananas and mix until well combined. Alternate adding flour mixture and buttermilk, beginning and ending with flour (3 additions of flour and 2 of milk). Fully incorporating after each addition. Do not overmix. Add vanilla and whip on medium-high until silky and smooth. Place strawberries and sugar into a medium saucepan. Cook uncovered over medium-high heat, breaking down strawberries with a wooden spoon. Cook 5-10 minutes until softened and broken down. Cool completely before using. Place all ingredients into a medium saucepan, stir to combine. Bring to a boil over medium-high heat. Cook 2-3 minutes until thickened. Cool completely before using. Place chopped chocolate and cream into a microwave safe bowl. Stir to combine. Microwave for 20 seconds, stir. Microwave in 10 second intervals, stirring in between, until ganache is smooth and silky. Cool completely before using. 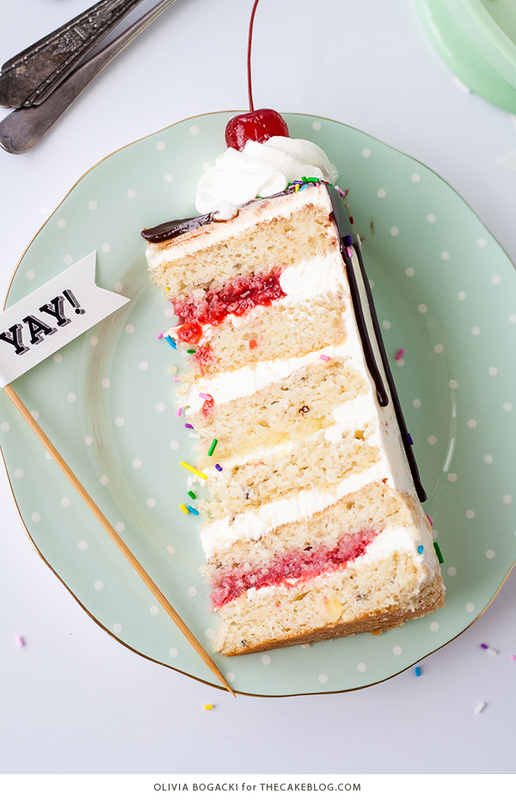 Place one layer of the cake onto a cake stand or serving plate. Spread a thin layer of frosting and, using a large round tip, pipe a dam of frosting along the top to hold the filling. Place 3 tablespoons of strawberry sauce inside the dam and spread evenly. Top with a second layer of cake. Spread approximately ½ cup of frosting on this second layer. Top with a third layer of cake. Spread a thin layer of frosting and pipe a dam of frosting along the top to hold the filling. Place 3 tablespoons of pineapple filling inside the dam and spread evenly. Top with a fourth layer of cake. Spread approximately ½ cup of frosting on this layer. Repeat steps 2 & 3 and crumb coat the outside leaving the sides of the cake exposed. Use a bench scraper to smooth out the sides and top of the cake. Chill for 20 minutes. Using a teaspoon, apply ganache near edges like so to create the drips like so. Pour some ganache to fill in the top of the cake and spread with an offset spatula. Sprinkle some sprinkles along the top edge and sides of the cake. When ready to serve, whip cream and sugar until thickened and pipeable. Fill a piping bag fitted with a large star tip. Pipe rosettes of whipped cream and top with maraschino cherries. * Ensure there is NO trace of egg yolks in your whites and that your mixer bowl and whisk is completely grease free or your meringue may not stiffen. obviously, i need to get more familiar with banana splits; had no idea there was pineapple involved! and i love that bright red pop of strawberry in the middle of the cake! Thanks Heather! I actually hadn’t had pineapple on one either but it is a pretty traditional sauce! Hi Cinta! 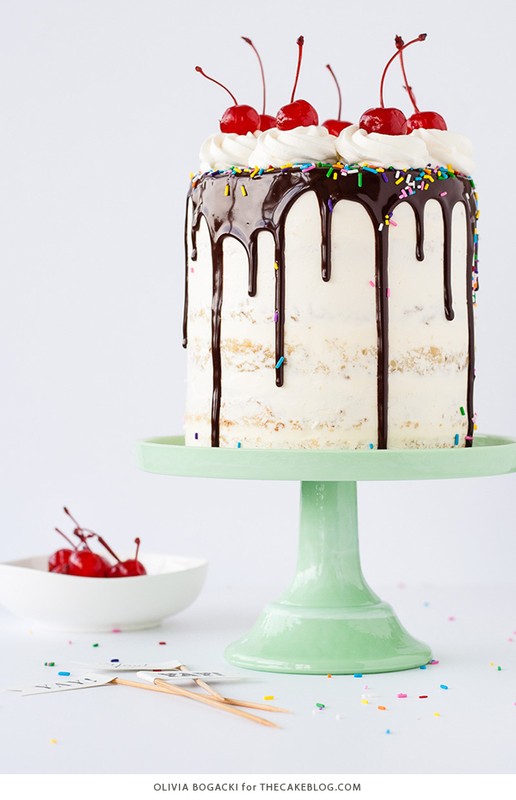 If you’re trying to do a 3 layer 8″ cake then you can either 1.5 or 2x the recipe listed. Otherwise using the recipe as is would do a 2 layer 8″ cake. I hope that helps! This cake sounds and looks absolutely amazing! I love this cake and I hoping I can make this next month for my kids bdays. We will all get together in the mountains and this will be perfect if: I can find 6″ cake pans and I can adjust the recipe for altitude. Love this and I use to eat banana splits like crazy as a kid. Haven’t had one in years and looking forward to trying this in cake form. Hi Vivki! I’m so excited that you’re going to try this cake! If you can’t find 6″ cake pans, you can use the recipe as is in two 8″ or double the recipe and use three 8″ pans. I hope that helps! Vicki* sorry, it’s morning here and my coffee hasn’t kicked in ;). No problem it happens to me too. I just checked and there are Target stores and Bed Bath and Beyond that appear to have some. Apparently BB & B have one by Wilton that are 1/2 size 6″ pans so you don’t have to slice them. I’m guessing the Bake time would be 15-20 minutes for those. Although there are only 5 pans. I’ll figure it out. Thank you though. 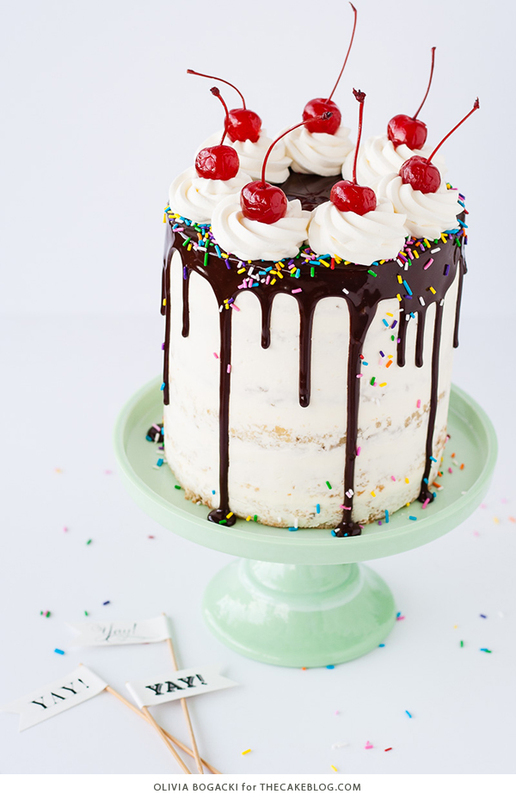 Can I make this Friday night and refrigerate and add the final touches (chocolate ganache, whipped cream and cherries) on Saturday before serving ? And for the canned pineapple – in heavy syrup or pineapple juice? Absolutely, just be sure to store it in the refrigerator. You could add the whipped cream and cherries right before serving or use a gelatin stabilized whipped cream to allow you to pipe them in advance. Sauces did not come out right even though I followed directions. Both very runny. Will not be able to use on cake. I doubled the recipe to make it in 3-9 inch cake pans. It wasn’t quite enough and I didn’t get enough rise to cut the layers in half. So I baked another double batch so I had 6, thin layers in total. The taste was great however. I just made the mix but did not get 3 6in cakes out of it . did I do something wrong ? I doubled the recipe to make it in 3 8 inch cake pans. It wasn’t quite enough and I didn’t get enough rise to cut the layers in half. So I jst assembled it with jst three layer .The taste was incredible. Is the cake in the photos made from two batches of the recipe? I baked one batch and only got three 1″ layers in my 6-inch pans. Not enough to torte. Wondering if I should go ahead and make another batch or just use first 3 and not torte them. Hope this is as good as it looks! Thanks. Can this sit for a day before serving😁? Absolutely, just be sure to store it in the refrigerator. Bring it out an hour or two in advance of serving so it comes back to room temperature. It will taste best at room temp. You may also want to hold off on the whipped cream garnishes until right before serving, so they don’t deflate. Alternatively, you could stabilize the whipped cream with gelatin allowing you to pipe them in advance. Enjoy! Like a few others commented, the cake did not rise very much. Right now they are cooling, but I can already tell that I will not be able to cut them in half. Any insight? I re read the recipe to make sure I did everything correctly. The batter was very runny when putting them in the pans. I will say that I didn’t have buttermilk on hand, so I made buttermilk from lemon juice and milk. Also, I wonder if the climate of where I live effected it. Below zero and dry out right now. Thanks for any suggestion of what might have gone wrong! 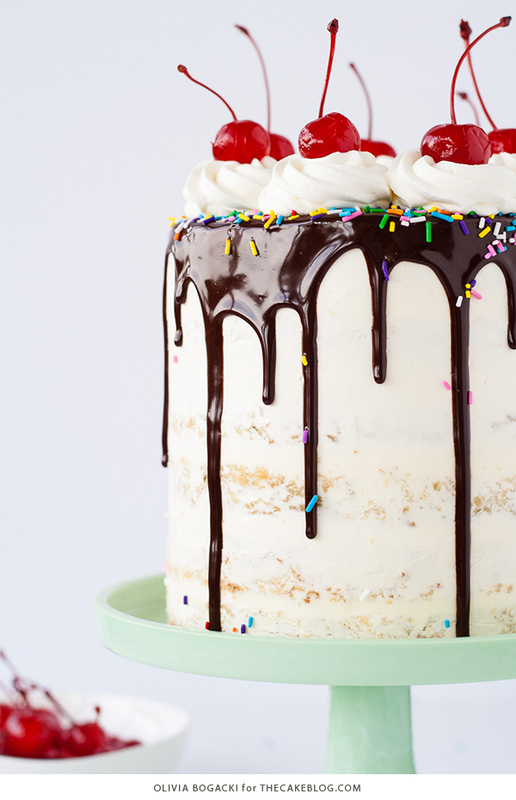 Do you need to refrigerate the cake after making it?